More candy than your guts can handle! Peach, Samus, Palutena, Lucina, Robin, and Wii Fit Trainer are all dressed up for Halloween, and they have raked in a massive banana horde-sized stash of candy. Now all that's left is to devour it all! 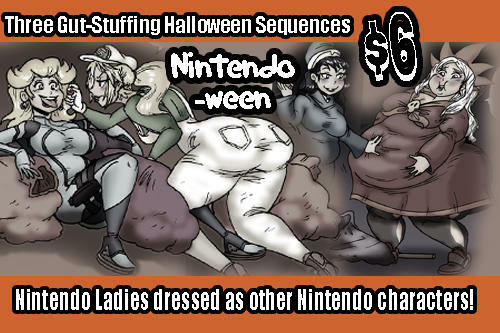 This image pack contains three stuffing weight gain sequences featuring girls from Nintendo. All images are hand drawn and inked, and then colored in Photoshop. -One 4 part sequence with Peach and Samus. -One 2 part sequence with Palutena and Wii-Fit Trainer. -One 4 part sequence with Lucina and Robin.